For 40 years, Garfield the cat has been a big fat hairy deal. The iconic comic strip created by Jim Davis originally debuted in 41 U.S. newspapers in June of 1978. Today, Garfield has 200 million regular readers in 80 countries, with the comic being printed and translated in 40 languages! More than 200 million Garfield books featuring comics, artwork, and even recipes have been sold as well! Along with print, the flabby tabby has made an impression on the screen with 2 theatrically-released feature films, 13 television specials and 2 animated shows that have combined for 12 seasons and more than 200 full episodes. Garfield is also a bit of a merchandise mogul too! There are more than 5,000 officially-licensed Garfield products available from over 400 licensees in 111 countries around the world. 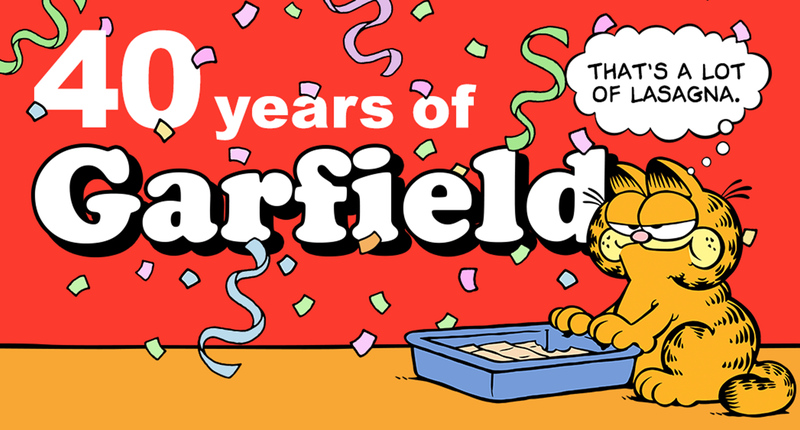 Take a look at our infographic below celebrating Garfield's 40th anniversary revisiting some of the most significant moments in the franchises history. Do you have a favorite Garfield comic strip? How about a favorite character? If you can't get enough of the famous feline by picking up his latest book or reading the comics on Garfield.com. If you're like us and enjoy a good binge watch, you could put a lasagna in the oven, throw on some Garfield costumes, and settle in for a marathon of Garfield and Friends. Now that's how you spend a Monday.